The 2015 Culinary Adventure Includes New Paso Robles Dinner Series, Culinary Personalities, Adventure Tours and More! San Luis Obispo County, CA (May 5, 2015)- All roads lead to SAVOR, September 24 - 27, 2015 during the sixth annual Sunset SAVOR the Central Coast food and wine festival. Tickets are now available for purchase, and for the month of May only, food and wine lovers savor huge savings on a Main Event Weekend Pass for just $100 (normally $150). In 2015, the culinary journey centers at the Historic Santa Margarita Ranch and features a fresh lineup of new events and experiences, including Adventure Tours, the new Paso Robles Dinner Series and celebrated culinary personalities. Sunset SAVOR the Central Coast is a unique partnership between Sunset, the West&apos;s leading lifestyle brand, and Visit San Luis Obispo County, the destination marketing organization for San Luis Obispo County, located midway between San Francisco and Los Angeles. Offering attendees an authentic taste of the California Central Coast, the four- day exploration highlights the region&apos;s signature destinations, sights, tastes and experiences. 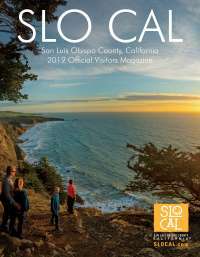 "In 2015, Sunset SAVOR the Central Coast offers a culinary adventure that shines light on some of the country&apos;s most popular tourism attractions, allowing attendees to check off those bucket list experiences, and enjoy all that the region has to offer," said Chuck Davison, CEO of Visit San Luis Obispo County. Throughout the four-day event, attendees indulge in the area&apos;s unspoiled &apos;Classic California&apos; lifestyle, unplug and enjoy countless delicious moments. SAVOR is uniquely inspired by the place it calls home - one of the most abundant agricultural regions in the U.S., the California Central Coast. The 2015 Sunset SAVOR The Central Coast food and wine event welcomes back its signature Main Event at Santa Margarita Ranch on September 26 and 27, 2015. This weekend food and wine tasting features ticketed seminars in Chef Central and Winemaker Central, as well as general admission access to tent tastings featuring leading winemakers, farmers, artisan food purveyors and the sounds of local bands. "By highlighting the region&apos;s unique flavors, agricultural diversity and remarkable artisanship, Sunset SAVOR the Central Coast brings the Sunset brand to life," said Peggy Northrop, Sunset Editor-in-Chief. "At SAVOR, attendees have the chance to truly immerse themselves in unforgettable experiences that they often only read about." Culinary Personalities - Join James Beard Award-winning author of Kitchen Gypsy (September 2015), international cooking teacher and chef, Joanne Weir, as well as popular food blogger, culinary instructor and author of Eating Up the West Coast (April 2015), Brigit Binns, during several SAVOR experiences throughout the four-day event. Adventure Tours - On September 24 and 25, attendees immerse themselves in the Central California lifestyle with the return of the popular Adventure Tour series. New tours for 2015 include: Paso Robles Inn Art Bar, an outdoor painting session held at the Paso Robles Inn; Take to the Sea in Avila Beach, a guided boat tour that provides a close- up glimpse of the unique ecosystem and marine wildlife of Avila Beach; and Innovative Traditions at Halter Ranch, a walking tour and opportunity to meet the winemakers at Halter Ranch Vineyard, the largest vineyard on the west side of Paso Robles. For a complete listing of Adventure Tours, click here. Main Event Weekend Pass -Priced at $100 per person through May, the Weekend Pass includes admission to the Main Event on both Saturday, September 26 and Sunday, September 27. Prices increase to $150 on June 1, 2015. Main Event Day Passes -Priced at $85 per person, Day Passes include single day admission to the Main Event on either Saturday, September 26 or Sunday, September 27. Chef Central and Wine Seminars -Priced at $25 per person, choose between several one-hour seminars, tastings and cooking demonstrations led by celebrity chefs, winemakers, sommeliers and industry experts during the Main Event. Chef Central and Wine Seminar tickets are available for purchase as an enhancement to the Main Event Pass. Adventure Tours - Priced at $85 per person, embark on a Central Coast excursion featuring unique tours, tastings and more. Find out the latest ticket and hotel offerings at www.savorcentralcoast.com, and join the SAVOR conversation on Facebook, Twitter, and Instagram. National and local sponsors to date include: Torani, GSO, Martin Resorts, Travel Paso Robles Alliance, City of Pismo Beach, City of San Luis Obispo, Santa Margarita Ranch, Vina Robles Amphitheatre, California Grown and Wine Coast Country. To exhibit at Sunset SAVOR The Central Coast, contact Caitlin Purkey at Purkey@FastForwardEvents.com. Sunset SAVOR The Central Coast is produced by Fast Forward, an event production and experiential marketing agency based out of San Diego, CA. Visit San Luis Obispo County is the countywide destination marketing organization and promotes San Luis Obispo County through advertising, marketing, public relations and group sales. Its membership base is comprised of over 500 tourism industry-related businesses including lodging properties, restaurants, wineries, golf courses and retail stores. Sunset SAVOR the Central Coast is produced and managed by the Bureau. For more information on Visit San Luis Obispo County, please visit www.VisitSanLuisObispoCounty.com. Sunset (www.sunset.com) is the leading lifestyle brand in the West. Through magazines and books, events and experiences, and digital and social media, Sunset covers the West&apos;s best flavors, destinations, design trends, and innovations. Sunset engages and inspires an audience of over six million educated, active and affluent consumers every month through its five regional print editions-Pacific Northwest, Northern California, Southern California, Southwest and Mountain-as well as via all tablet devices and its website. In addition to its print and digital publication, Sunset showcases the region&apos;s unique lifestyle and noteworthy destinations through its flagship events, established home programs, licensing partners, books and International Wine Competition. Sunset is produced by Time Inc. (TIME), one of the largest media companies in the world. As an award-winning turnkey event management, public relations and marketing solutions provider, Fast Forward specializes in the creation of world-class trade and consumer events, brand activation and experiential marketing strategies. From elite wine and food experiences for thousands of discriminating palates to intimate brand-to-press networking events in the heart of Manhattan, productions by Fast Forward Ventures accelerate human connections, put brands in front of key influencers, and deliver an unparalleled return on experience. Fast Forward Ventures is the producer of Cooking Light & Health&apos;s The Fit Foodie 5K Race Weekend, Editor Showcase NYC, SommCon USA, and the San Diego Bay Wine & Food Festival, Southern California&apos;s largest luxury wine and culinary experience now in its 12th year.